An Oklahoma native, I am no stranger to hot summer days. When temperatures rise, I stay motivated to move by choosing fun new activities that don’t feel like a workout. Last week when the thermostat hit 90, I moved my classroom to the canal where my students and I stayed cool and active canoeing. ¿Canoeing? ¿As in summer camp and row, row, row your boat? ¡Sí! 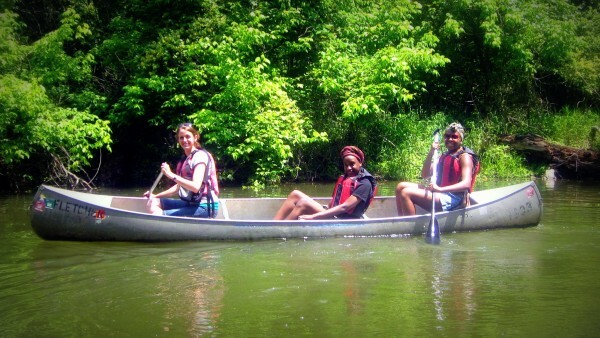 Canoeing is a fun activity anyone can do. This long open boat usually holds 2-3 people who work together to paddle across still or moving water. Although most of our group was new to this water sport, everyone learned quickly and had a great time. Get a great workout for any fitness level: Rowing works your shoulders, back, and core--a great way to sculpt for summer swimwear! You control the pace, so beginners can take it easy while they get their sea legs, as advanced athletes kick it up a notch with canoe races or “sprints” of paddling at top speed for short increments. No motor means you’ve gotta work it to move. It's a great group activity: Upcoming family vacation or girls weekend? Canoeing is even more fun with others. Help your crew row and keep each other entertained with good conversation. Trying new things makes it easy to stay active and in shape: Unless you work at the boathouse you probably won’t be paddling the river every day after work. The novelty of this nontraditional workout makes it easy to push yourself and work harder than you do in your regular routine. Canoeing provides a refreshing change of scenery: Rushing water, green scenery, cool breeze, I always feel energized after being in nature. Spending time outdoors does wonders for your body and mind, as I explain in Fitness: 3 Reasons to Exercise Outside. ¡Sounds fun! ¿Where can I canoe? Look up a boathouse or rowing club in your area where you can rent canoes hourly or for the day, like I did with my amigas in college to make the long drive to the river worth it. Don't let lack of experience hold you back. Most rental services provide a brief lesson to get you started and you can brush up on canoeing basics here. Loved it? Also try closed kayaks and leg-propelled paddle boats, or get a boat-inspired workout on the rowing machine at your gym. Always wear sunscreen: The water may keep you feeling cool, but the sun is still burning down! Wear a life vest: Even strong swimmers can be caught off guard. Avoid sudden or jerky movements in the boat. Tie your supplies down and keep electronics in a waterproof container or pouch. Instead of using the summer heat as an excuse to skip your exercise, keep moving with a water sport like canoeing. When you're having fun and trying something new, you won’t even notice you're working hard. What are your favorite ways to stay active in the heat?